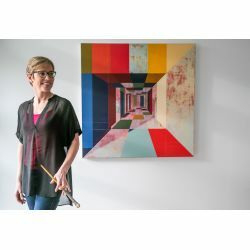 "Mary's murals combine natural landscape elements with abstract perspectives and stunning colors"
Mary lives and works in Seattle, Washington. Her paintings and murals explore the balance between the natural world and technology. Her main sources of inspiration are the three magnificent National Parks close to her home: Mount Rainier, Olympic, and North Cascades National Parks. In 2015, her work was featured on the cover of Juxtapoz Magazine, and also featured in Foreign Policy Magazine, Huffington Post, and The Boston Review. She works with galleries in Seattle, San Francisco, Los Angeles, Germany, Paris, and Amsterdam. Her most recent mural was created for Washington State Employees Credit Union in Seattle's University District. Mary teaches painting at Skagit Valley College in Mount Vernon, Washington, where she is a tenured faculty member and chair of the art department.